The first phase of the kitchen design – elaboration of the sketch, which will be built space. It is very difficult to keep in mind the project facilities and to remember all the nuances, especially because the imaginary image of the interior is very different from the actual result. So you should spend time sketching. Before you draw a sketch of the kitchen, measure the distance between walls, window and door and floor and ceiling. Draw on a sheet of paper to each wall of the room and check on her sockets, pipes, heating appliances, Windows and doors. A few times to redraw the sketch, cut out of colored paper rectangles and squares are proportional to the furnishings and place them on the diagram. Move and match the layouts until, until you reach a satisfactory result. Then transfer the sketch to paper. Consider what pieces of furniture you can place in this space. Draw the approximate location of cabinets and appliances. Start with large items like the refrigerator and a tall Cabinet. Then draw base cabinets and the least suspended. Determine which technique can be embedded, and which devices need to be masked, for example, gas boiler, pipe and duct. On the sketch, try to maximize efficient use of space kitchento make it more functional. Remember the work triangle "of refrigerator – sink – stove" and note that between these items must be work surface for ease work in the kitchen. Particularly noteworthy are the Windows and doors in the kitchen. Mark on the sketch the distance at which the door opens, to later do not block this area with furniture. The Windows should be open as to the radiators. Should consider how to ensure unimpeded air circulation in the kitchen. Drawing a sketch of kitchen, pay attention to fire safety. Do not place the stove, especially gas, in front of the window, curtained on top of flammable curtains. So it is not necessary to hang above the fireplace, the cabinets, this place needs to accommodate the hood. 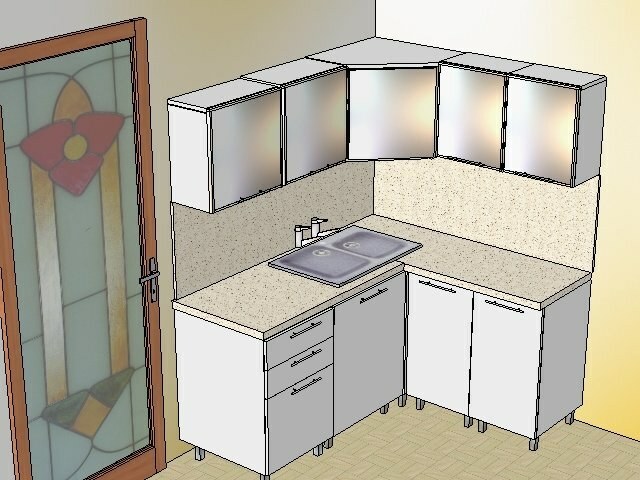 Once you have drawn the sketch of the kitchen on paper, transfer it to 3D model using special computer programs. Or contact the professionals to create a more detailed design of the future kitchenin which it will be created to order.